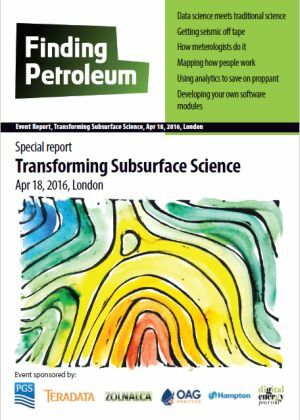 Ultimately, subsurface Science can be summarised as “drilling profitable wells”. The key is to learn how to do this in a predictable, repeatable way (as opposed to drilling ‘on trend’; in a pattern; or effectively randomly). Well-established ‘rules’ have been proven for Stratigraphy, Structural Geology, Sedimentology and describing Petroleum Systems (especially by creating GDE, CRS and CCRS maps). Nowadays these ‘rules’ are most commonly applied through seismic data, especially 3D seismic data. The key ‘technologies’ are a) large quantities of inexpensive multi-client 3D seismic and b) commoditised interpretation workstations. In truth, this methodology has now become completely commoditised: little commercial advantage accrues from getting it right, simply disadvantage flows from incompetent execution. Thus, if future competitive advantage is to be found, it must lie in either Data Mining – applying Analytics to data sets that are so large that they do not allow easy interpretations by humans - or Modelling & Inversion – especially those using and/or integrating more powerful geophysical technologies than towed streamer 3D seismic! Thus it is on these two topics that we seek presentations at our April 18th Forum. Please contact David Bamford if you have an idea or two you wish to share! Note - we are exploring a similar topic in Aberdeen on May 4, in our conference "Subsurface IT and competitive advantage"
Andrew Zolnai promotes web mapping and volunteer geo info at Zolnai.ca. For almost a decade in EMEA he held geospatial lead and subsurface integration positions. The prior decade in the US he was petroleum manager with Esri and senior consultant Landmark Halliburton. His first decade in Canada he held various positions in petroleum data management, GIS and field mapping. He is Certified Petroleum Geologist with over a dozen refereed and industry publications. We help you sketch out your information supply chain. Map your people, processes & Technology in a single web dashboard. - Legacy data is often key in any M&A due diligence process and asset valuation. It allows full data/information audit/validation. and the main file I/O and exchange location. They also contain that legacy hard to discover data. Data mining requires structure and currently intensive data preparation (clean up). The paper gives an insight as to how such legacy can be first discovered, then prepared for data mining & analytics. Hampton Data Services (HDS) was established in 1991, as a geotechnical data processing company specialising in legacy data. HDS's mission is to provide the highest quality, comprehensive, auditable, Data Management and Information services aimed at delivering interpretation-ready data, on time, to its customers' geoscientists. The success of this initial strategy speaks for itself, ensuring that HDS is now the chosen service provider for many of the industry's major players. This in turn has enabled HDS to expand and diversify into being a provider of a comprehensive range of software and service solutions. With an highly experienced team, multi-lingual geoscientists, system engineers, software developers, and support staff, HDS is fully committed to providing you with the right solution for your data. Data Science versus Geoscience in E&P: "And", not "Or"
Luther Birdzell is a seasoned technologist with a fifteen-year track record of delivering transformational value at the confluence of process and technology. OAG Analytics delivers the value of big data, machine learning, and predictive analytics to the upstream oil and gas business. Our purpose-built workflow creates competitive advantage for oil companies, lenders, and private equity firms by using advanced analytics to value and optimize upstream assets.